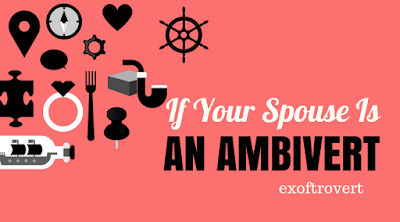 If Your Spouse Is An Ambivert - Everyone must have different ideal partner criteria. Someone idolize an introvert that seems mysterious or just the opposite, your idol is an extrovert that can make the atmosphere always looks fun. But what if it turns out your partner is not both but an ambivert? 1. Sometimes, your partner will be very difficult to guess. Usually, after spending time together either a walk or just talk from heart to heart, the bonding of a partner will be stronger. But you should not be surprised if after going on a picnic together and spending time together, suddenly your partner did not contact you all day. She was just exhausted and needed a little time to recharge her energy. 2. Could be, he who always makes you laugh because the joke, suddenly doesn't want you to meet with your friend just because he feels shy. Your partner can be a very joking person and entertain you with a million ways to make you laugh, but while with others, he becomes the most reserved person you've ever met. That does not mean that he does not like your friends, it's just that he does not like the atmosphere that is too crowded. He will feel awkward even though he also wants to join in your chat. 3. He experts for making you happy because a lot of doing exciting things, but he can also be the most comfortable friends to sit together without speaking. It's nice to have an extroverted couple because you will be taking him around to do many exciting new things together. But if your partner is an ambivalent, besides being able to spend time with lots of excitement, you can also take him to sit all day in the local library to read books. According to him, sitting together without a word is very meaningful. 4. Although very enthusiastic when telling you something, an ambivert can be counted on to become a listener. Not only can and excellent speakers, an ambivert can also be a good listener like an introvert. He will be quiet and listen to your story with enthusiasm. Ambivert has both capabilities well. 5. Changes in the mood very quickly sometimes make you confused. Because an ambivert basically has two personalities in him that is introvert and extrovert, then the change of mood that happened so fast also often happened. Do not think that your partner has multiple personalities, yes. It is just between introverts and opposite extroverts. Remember, your partner is not a freak or a mental illness because of all the abilities he can do. Its ability to adapt to introverted and extroverted environments is a uniqueness. In psychology, we recognize the 5 Big Personality Traits, a personality test based on 5 categories: openness, extroversion, agreeableness, conscientiousness, and neuroticism. All five are calculated on a scale basis. For example extroversion or how you express yourself and how you interact with others. Your boyfriend is an ambivert, whose scale is in the middle of the extrovert and introverts. His rapidly changing attitude is also a form of adaptation to the problems or situations he faces.